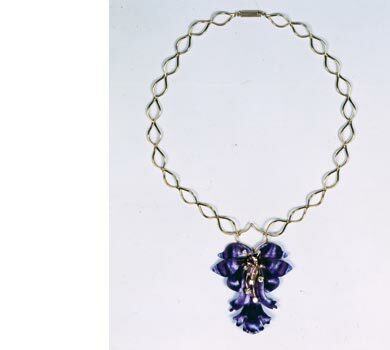 Although Pauline experimented with titanium while studying jewellery at Sir John Cass College in the 1970s, it was the related refractory metal, niobium that stimulated her own creativity. Her husband, Peter Gainsbury, who was Technical Director with the Worshipful Company of Goldsmiths introduced niobium as a decorative material to jewellers and silversmiths in the UK. Niobium exhibits a similar colour potential to that of titanium but has the added attraction of much greater malleability. Niobium can be chased and forged without the need for annealing as is demonstrated in the exhibited pieces. Pauline’s design inspiration from the natural world of flowers is realised in niobium decorative elements combined with precious metals and gemstones.